The last of the little goblins have departed my doorstep, I've brought the jack o' lanterns inside, and bid farewell to Hallowe'en and October. It's been a very busy month again for me, between family and my work, local Family History Month events, and teaching my latest Online Genealogy class for the Community Colleges of Spokane. Also, I got an opportunity to speak with...oh, wait, that's a surprise (stay tuned!) . I didn't get a chance to participate in many of the Genea-Blogger events this month, but did take what opportunities I could to read posts during my breaks at work via Google Reader. I did, however, update the links whenever I had time on the "October Is..." post. You can go there to view all the carnivals, challenges and other events that took place. Things have been awfully quiet on my blog lately, due to a variety of circumstances that have kept me from posting regularly (in fact, I'm blogging for the first time ever on my work lunch break via a widget on my iGoogle page). However, I did want to let everyone know that Scanfest will be held as usual on Sunday, October 26th from 11 AM to 2 PM, PDT. If you would like to know more about Scanfest and how you can participate, click on the Scanfest label below to check out other posts with detailed information and instructions. This may be the last Scanfest for me for a while, since I will be having shoulder surgery November 14th. We also normally take a break in November and December, due to the holidays around the last weekend of those months. Hope to "see" you Sunday! This is what happens when you don't have time for blogging. A meme comes along, and everyone tags you for it, thinking you haven't been tagged yet. When you find a moment to participate, there isn't anyone left to tag! :-) Randy Seaver over at Genea-Musings started a Tag meme on Tuesday, and it has swept through the genea-blogger world. It's actually a fun one (i.e., I don't have to think to hard; therefore, I can write it quickly!). Thank you to Paula, Tim, Lisa, Denise, William, and Kathryn (and any one who tags me before I publish this) for tagging me! Since I'm writing this before I head out of town, I don't have time to hunt for those who haven't already been tagged. If you come across this and wish to participate, consider yourself tagged by me. 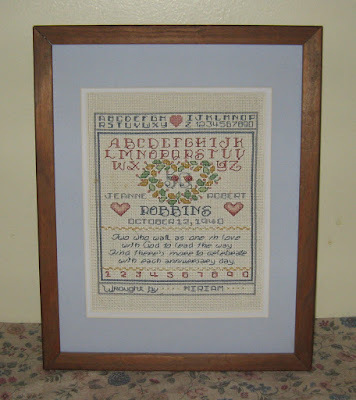 Source: "50th Anniversary Sampler of Robert and Jeanne (Holst) Robbins", created 1990 by Miriam (Robbins) Midkiff. Photographed and privately held by Miriam (Robbins) Midkiff, [ADDRESS FOR PRIVATE USE,] Spokane, Washington. 2008. I created this cross-stitch sampler 18 years ago in commemoration of the 50th anniversary of the marriage of my paternal grandparents. My parents attended the celebration, which was held at my grandparents' church in Polkton Twp., Ottawa Co., Michigan, just outside the town of Coopersville where my grandparents and their children lived for many years. I had taught myself cross-stitch three years earlier, after admiring the work my husband's sister-in-law did. This particular sampler was difficult to do as some of it required working with gold metallic thread, which broke easily and was flat versus the round cotton threads used in conjunction with it. Clicking on the image above will bring you to my Picasa photo album, where you can zoom in to view the glints the gold threads make. My grandfather passed away 28 December 2003, after being married 63 years to his "Jeannie with the light brown hair." My grandmother now lives with my uncle and his wife in Michigan due to her advancing age and Alzheimer's. When one of my aunts cleaned out my grandparents' retirement home in Texas a couple of years ago, she came across the sampler and returned it to me. I haven't done cross-stitch in years, but seeing it again has inspired me. Perhaps someday I'll create some sort of heritage or family tree piece. Two genealogy books--both featuring using the Internet to help you trace your family tree--have recently been published, are available to purchase within the next week, and are both on my wish list (hint, hint, family members...the holidays are soon approaching)! The first is Dan Lynch's Google Your Family Tree: Unlock the Hidden Power of Google. I've been aware for quite awhile that Dan was getting ready to publish this treasure, and I can't wait to try it out! I already use many features of Google as tools for my research, but I'm sure I'll find lots more search tips and techniques. This is the first book on Google that specifically targets using the search engine as a genealogy research tool. You can reserve your copy here. 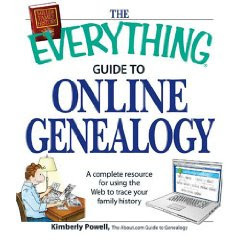 The second book is The Everything Guide to Online Genealogy: A complete resource to using the Web to trace your family history by Kimberly Powell. I've been using Kimberly's The Everything Family Tree Book as an optional text/reference book for the Online Genealogy classes that I teach through the Community Colleges of Spokane. Although I haven't yet seen The Everything Guide to Online Genealogy, if it's half as good as her first one, then I'm going to have to add this to my list of recommended reading that I give each of my students! Congratulations to Dan and Kimberly on their newly-published works! This, That, and Much More! Having blogged very little in the past week, there's a lot of catching up to do! Scanfest was done in two sections last Sunday. A group of us met via Windows Live Messenger and chatted there, while others met with Thomas using Skype for a conference call. There were a few who went back and forth between the two media. I think we all enjoyed ourselves, but those who were using Skype soon determined that they could not scan and Skype at the same time successfully. Denise did a good summary, "Skyping at Scanfest," at her blog, Family Matters. The next Scanfest will be held Sunday, October 26th from 11 AM to 2 PM, PDT. Go here for more information. Terry at Hill Country of Monroe County, Mississippi did a great round up of introducing genea-bloggers from around the blogosphere, in three parts of "Getting to Know You"! You can read about 42 genealogy-loving and blogging personalities from around the globe here, here, and here. In Part I, you can also click on the title link to hear Terry himself sing "Getting to Know You" in his gentlemanly southern voice, which I always enjoy listening to whenever a group of us does a conference call via Skype. Our good friend Craig of Geneablogie was laid up in the hospital during the time that these posts were put together, but today he published "Getting to Know Me--Getting to Know GeneaBlogie." My own article can be found here. You've heard of Craig's List, but have you heard about Angie's List? It's a site where you can find professionals to help you with your service and repair needs, as well as health care providers. Well, Thomas of Destination: Austin Family got his 15 minutes of fame last July when he was interviewed by Angie's List, along with three professional genealogists, for Angie's List podcast. Additionally, he appeared in Angie's List e-zine, which is e-mailed to all of their members. Kudos to Thomas for some well-deserved recognition! The Family Curator has posted the Treasure Hunters Round-up of those participants who are planning to go through their genealogy treasure boxes to organize, scan, and archive their "goodies." They hope to find a surprise or two! Stay tuned for later this month, when they'll share their results. Colleen at Orations of OMcHodoy has the Genea-Blogger Yearbook up: a hilarious peek at what we'd look like if we attended high school in various decades! While I didn't participate directly, Thomas used me as a model here. I think 1962 was my best look; don't you? Becky at kinnexxions wrote A Salute to the Old-Timers! in response to Tim's Everyone's Turning 2 This Year at Genealogy Reviews Online. Yep, this blog turned two years old in January, and I guess I'm now officially an old-timer! 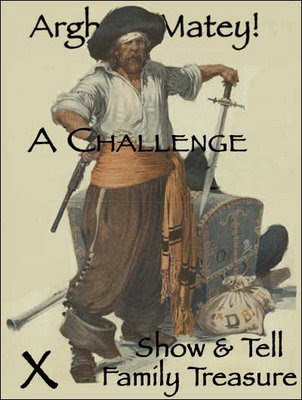 The 57th Edition of the Carnival of Genealogy has been posted by Jasia at Creative Gene. The theme is "I Read It in the News." Holy cow! There are 47 submissions of articles describing how the participants found relatives or ancestors in newspapers. The COG continues to grow, adding newbies every time. It's a great way to learn more about genealogy, research, and writing, and to discover new blogs to read. My apologies to Family Tree DNA, who has been sending me updates about their Houston, Texas lab in relation to Hurricane Ike. I've been too busy to post these on the blog, but fortunately, they sent them out to many bloggers, including Elizabeth of Little Bytes of Life. She has posted them here, here, and here. If you had a DNA test done through this company and are concerned that this facility was in harm's way, please be assured by these postings that everything has been kept safe. There were also two updates from FamilySearch last week that I did not get to, but Renee of Renee's Genealogy Blog has them here and here. There have been 29 million names added to Record Search pilot this past week alone! A new website, GenSoftReviews, has recently opened as a place where users can post reviews about their favorite genealogy software. Of course, I gave high marks to RootsMagic! Public Records Free Directory blog has a new tool you can post on your iGoogle home page to help you get to their Directory pages right away. The Kindo family tree networking website and MyHeritage genealogy site have joined hands. Read about it on the MyHeritage blog here. I've added the Carnival of Central and Eastern European Genealogy, which I accidentally omitted (so sorry, Jessica), The Polish History and Culture Challenge, and several more national holidays I discovered. Check out the October 2008 Calendar of Events here. It's a busy month! Whew! 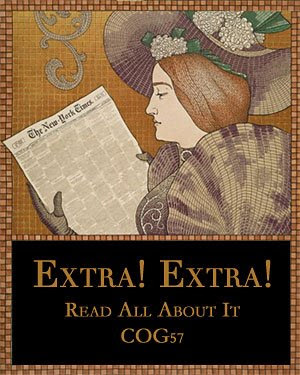 Posted October 4 - the 57th Edition of the Carnival of Genealogy - I Read It in The News! Posted October 18 - the 58th Edition of the Carnival of Genealogy - Halloween Hauntings...Fact or Fiction? Posted October 23 - Treasure Hunt Challenge Round-Up: Just Look What We Found in Our Cupboards & Closets & Boxes! Read Thomas' newest post on this subject here.